Battalion Commander is a war shooting game designed by Iriysoft - a company in Bryansk, Russia with the CEO is Dmitry Pavlenko. They released that game on 30th of August, 2016. It is now on PS Vita and PS4. That game runs with Flash to integrate with all browsers. 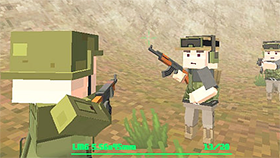 Players will join in that game to control a hero soldier. They have to build an army with allies (Each team can have up to 10 allies). The mission for the soldier is to get experience points and collect money. There are special skills ready to use when a player is close to death, don’t forget to use it and call help from other soldiers to complete the tasks. The game has 3D fantastic graphics. You will experience the wartime with many types of vehicles and warplanes as in real life. This game is for everyone at any ages. Battalion Commander is worthy to play. This game is assessed 8.8/10 point by many gamers around the world. There is no reason for us to ignore it. Try it on Freegames66.com and you can play directly after a click. Because the version is unlocked so you and your teammates play with no fee required.